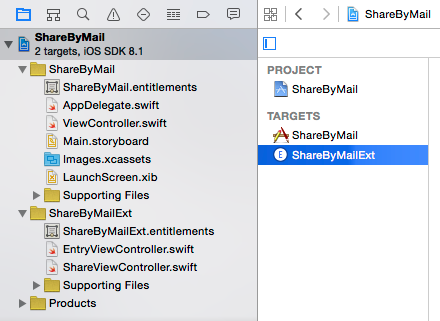 I was having a little fun creating a share extension for iOS 8 in Swift. One problem I quickly stumpled upon was the need to get rid of the storyboard so that I could just setup the view inside the view controller. But in Swift this is not going to cut it. It turns out thereøs some weird module naming going on so you'll get an error when running the code. Running the extension now will work, but you won't see anything because nothing is actually contained in the view and the background is transparent. One of the other problems I initially stumpled upon was a way to present the view controller modally and animate up from the bottom. I tried to use this `EntryViewController` as merely the entry point and then in `viewDidLoad` present a main view controller as a modal view. And it actually worked, but I was getting some nasty [`unbalanced call to begin/end appearance`](http://stackoverflow.com/questions/20919616/keep-getting-unbalanced-calls-to-begin-end-appearance-transitions-for-viewcont) warnings in the log so I found a better approach. This makes the view appear in full screen and it will appear just as when you call `self.presentViewController(vc, animated: true, completion: nil)` from any other view controller. When the user wants to cancel or submits the content for sharing inside your extension, you need to tell the extension that you're done but by default your view will just get hidden without any easy transition like you'd expect. Just as you needed to manually animate the presentation of the view, you also need to animate the dismissal of the view. Notice how the completion handler of the animation calls different methods on the `extensionContext` depending on the action taken by the user.